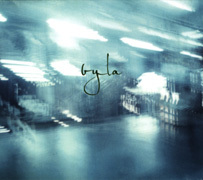 In the opening moments of their self-titled debut CD, Byla (48'39") deliberately shift mood a few times. This tactic has an unsettling effect on the listener. These splices feel like weird transitions in a dream and jump cut from one untethered theme to another. Yet, as in dreams, it seems appropriate. Kevin Hufnagle and Colin Marston are behind the sounds and their trajectory. Once past the introductory passages, the album moves through several stratums of energy and tonal complexity. Passages range in content from pleasant acoustic guitar riffs to contained layers of screeching feedback. While one track builds into absonant wall-of-sound power chords, another peacefully strums through chord changes. The 11 tracks are perceived as a seamless work by creating brilliant transitions between the energy levels. It's very cool that the gravity of each piece prevails while still relating to what it arose out of. Somewhere around the mid-point of the album, the surge of sound settles down into a more timorous tone. Throughout this area the duo delve into deep revelations on how far the sound output of a guitar can be taken. Through innovative playing, processing and arrangement, Byla coax a wonderful diversity of emanations from their instruments and studio. How ironic that most listeners of this Ambient Music will likely doze through these sonically detailed sections. Those making it through Byla's music (which is this deliberately spare) will find pondering what went into the compositions less interesting than what the musicians felt they had to keep out.